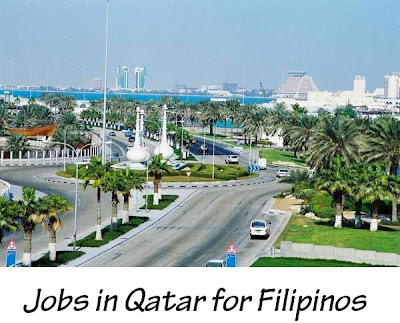 Jobs in Qatar for Filipinos await. That's practically what Vice President Jejomar Binay reported after going there last weekend. As Presidential Adviser for Overseas Filipino Workers’ (OFW) Concerns, VP Binay visited the rich emirate Qatar, currently employing some 2, 000 overseas Filipino workers. According to Wikipedia, Qatar has the world's largest per capita production and proven reserves of both oil and natural. Its economy grew the fastest in the world in 2010. In 2022, it will be the host country for the World Cup. It is nice to learn that overseas Filipino workers there have established a solid reputation for being hardworking, disciplined, highly skilled and very professional coming from Crown Prince Sheik Tamim bin Hamad Al-Thani himself. This is welcome news for Filipinos looking for work abroad, especially in Qatar. As we now all know, work abroad opportunities decreased in large part because of on-going political strife on several countries and also because of more strict immigration and employment policies in others.